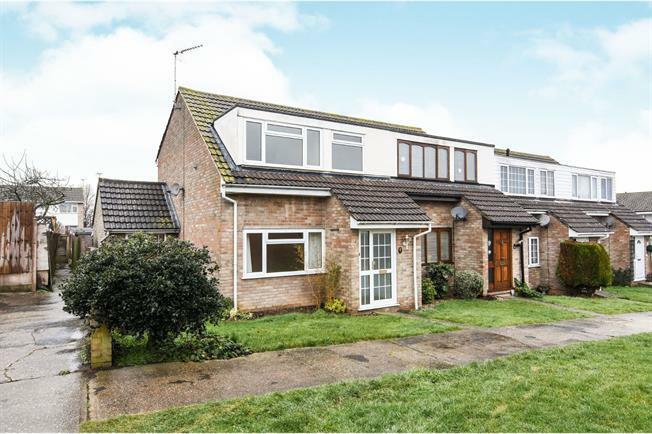 3 Bedroom Semi Detached House For Sale in Braintree for Guide Price £250,000. This spacious three bedroom family sized home has been extended to the side, offering an additional reception room and ground floor wet room with WC. The ground floor is open plan with wood flooring, and to the first floor there are are three generous bedroom all with brand new carpets. The rear garden is mainly laid to lawn with a small patio area, well planted borders and a generous size front lawn. To the rear there is a single garage, and further parking available at the end of the walkway. The front porch is the perfect place to store coats and shoes, and offers a welcome break between the front of the property and the sitting room. The sitting room is open plan with wood flooring, light is flooded in through from the dual aspect windows and French doors to the rear. This room is open plan to the extended dining room, and the stairs lead up to the first floor. Part of a side extension, the dining room offers an additional internal space perfect when entertaining. There is a window to the front and access to the ground floor shower room. Requiring some updating, but still a fantastic addition to the property, this room is currently set up as a walk in wet room with separate WC. Requiring some updating, this separate kitchen has lots of eye and base units with space for all free standing white goods. There is a window overlooking the gardens and a back door for access. The master bedroom is at the front of the property and is a generous size bedroom with enough space for a king size bed and all furniture. The carpets have been newly laid with a neutral colour. The second double bedroom is at the rear of the property with views over the garden, this too is a great size double bedroom. The carpets have been newly laid with a neutral colour. The third bedroom is a generous single at the front of the property, with a built in storage cupboard over the stairs. The white bathroom suite is at the rear of the property which is a three piece suite comprising; low level WC, panel enclosed bath and pedestal wash hand basin. The rear garden is mainly laid to lawn with a small patio area, well planted borders and a generous size front lawn. To the rear there is a single garage, and further parking available at the end of the walkway.